Objective: Given an array of n+2 elements. All elements of the array are in range 1 to n and all elements occur once except two numbers which occur twice. Write an algorithm to find the two repeating numbers. Naive: This problem can be easily solved using two nested loops. Take each element at a time and compare it with all the other elements and if it appears twice, print it. 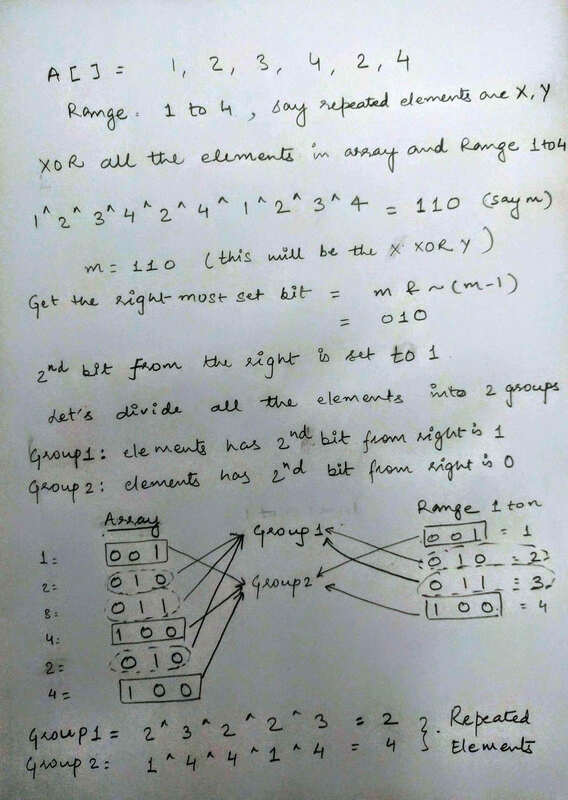 This solution will work even if all the numbers are not in the range of 1 to n.
This solution will work even if all the numbers are not in the range of 1 to n.
Keep the count of each element in the Hash Map. Print the elements which has count = 2. Product of 1 to n elements = n!, Product of all array elements = Y, so a * b = Y/n! This solu­tion works only if array has pos­i­tive inte­gers and all the ele­ments in the array are in range from 1 to n.
(If it already not negative). If A[x] is already negative, then it means we are visiting it second time, means it is repeated. Sim­i­lar approach used in prob­lem : If array has all con­sec­u­tive numbers. As we know A XOR A = 0. We have n + 2 elements in array with 2 repeated elements (say repeated elements are X and Y) and we know the range of elements are from 1 to n.
XOR all the numbers in array numbers from 1 to n. Result be X XOR Y. 1 XOR 1 = 0 and 1 XOR 0 = 1 with this logic in the result of X XOR Y if any kth bit is set to 1 implies either kth bit is 1 either in X or in Y not in both. Use the above step to divide all the elements in array and from 1 to n into 2 groups, one group which has the elements for which the kth bit is set to 1 and second group which has the elements for which the kth bit is 0. Now we can claim that these two groups are responsible to produce X and Y. Group -1: XOR all the elements whose kth bit is 1 will produce either X or Y. Group -2: XOR all the elements whose kth bit is 0 will produce either X or Y. Sort the array, this will bring all the repeated elements together. Now traverse the array and compare the adjacent elements and print them if they are same. 258 queries in 0.138 seconds.